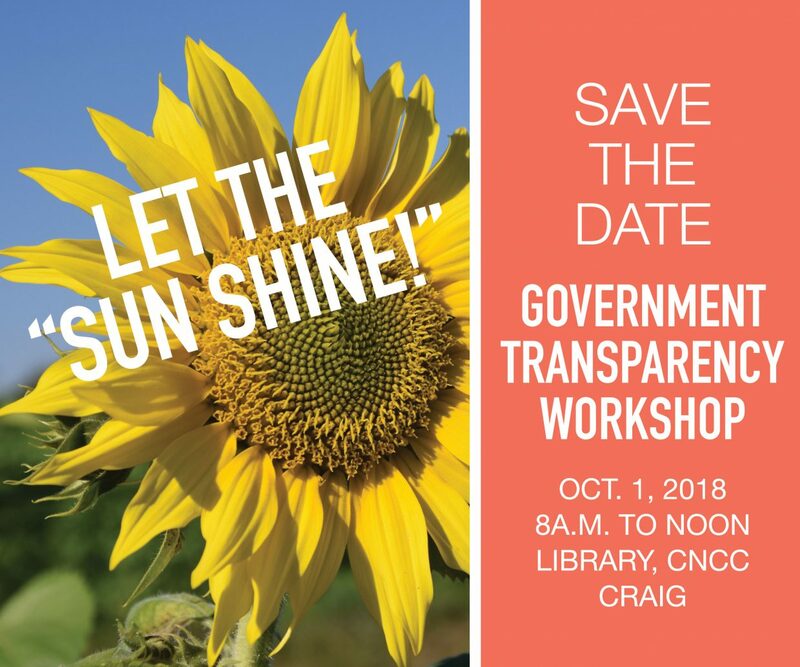 The Craig Press invites the public to join the editorial staff on Monday for a half-day workshop on government transparency. Speakers for the event will include Jeff Roberts, executive director of Colorado Freedom of Information Coalition, and Corrie Ponikvar, chair of the Moffat County Republican Central Committee and former executive director of Moffat County United Way. Ponikvar also has 30 years of nonprofit experience, including five years on the board of The Memorial Hospital. “We are excited about this training,” Ponikvar said. She will speak about the importance of government transparency and what members of public boards need to do to uphold their roles and responsibilities to the community. “Information is power, and the more information they have, the more confidently they can serve on a board. Things go better, the service is better, and they enjoy their service better,” Ponikvar said. Several Colorado laws regulate how public business is to be conducted. Roberts made use of the regulations as a reporter, assistant city editor, and data journalism specialist at The Denver Post from 1984 through 2007. “We educate the public about their rights under the open meetings laws, open records law, and court proceedings; we work at the legislature to support the efforts of as much government transparency as we can. Sometimes, that involves working at the legislature,“ said Roberts when describing his work at CFOIC. While he noted it is especially important for public officials to know about Colorado’s laws, he also hopes citizens will attend the event. The workshop will be held from 8 a.m. to noon Monday, Oct. 1 in the library at Colorado Northwestern Community College, 2801 West Ninth St.
For more information to RSVP, contact Sasha Nelson at snelson@craigdailypress.com or 970-875-1794.